This DIY Mother’s Day Napkin Holder is easy to make, it's useful and mom will love it! 1. For the side panel, take 12 sticks and lay them side by side. 2. 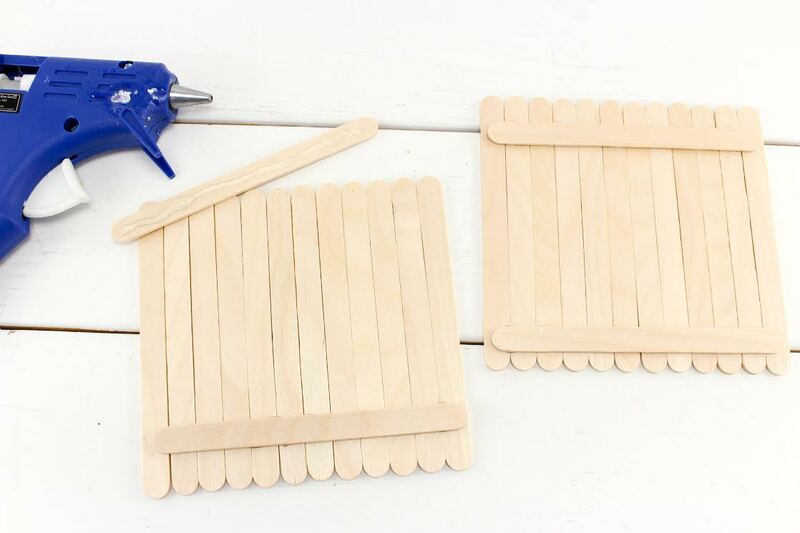 Using hot glue, attach one craft stick across them about ¼ inch from the tops and another craft stick across them about ¼ inch from the bottoms. 3. Repeat that process for a second side panel. 4. For the base, you need to cut 6 sticks in half so you have 12 pieces. 5. Lay these side by side and glue one stick across them about ¼ inch from the tops and another craft stick across them about ¼ inch from the bottoms. This should look just like the side panels except smaller. 6. Decorate the panels using your washi tape any way you like. 7. Now, glue the side panels perpendicular to the long edges of the base panel, with the cross sticks to the inside. Glue a regular craft stick to the outside of each side panel (at the bottom) to provide extra support. 8. Apply the letters to spell out the word Mom or Moms Napkins, or any words you would like. As a mom, I know that I love homemade gifts above all others. 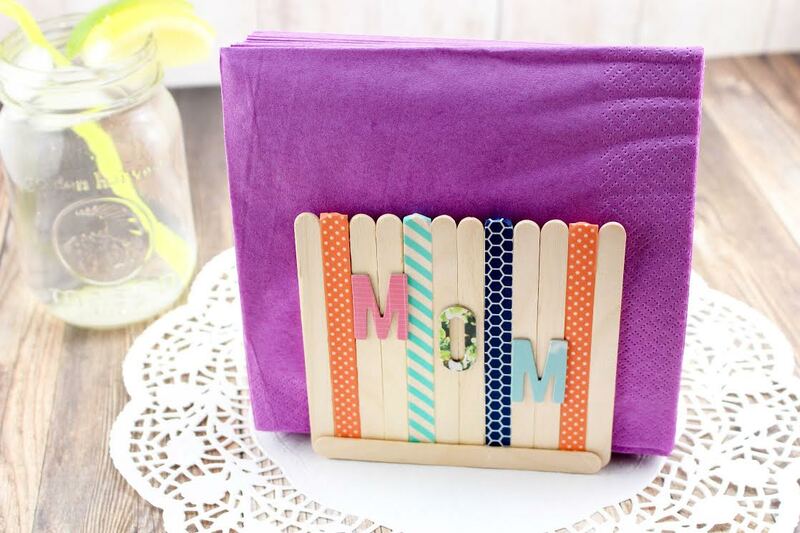 This Mother’s Day Napkin Holder is a total win/win, too – it’s homemade AND practical. So tell me, what are you getting for your mom this year? I love this idea! I might have to get my daughter to make one for my mom. Too cute. Ahh! That came out beautiful! I love this idea!! This is so beautiful.I love this idea.I am sure this great as a mother’s day gift! What a cute craft for the kids! We moms love homemade gifts from the kids and this is such a cute napkin holder. Oh how cute are these, what a lovely idea for a table decoration as well as a useful napkin holder. This came out so pretty! I love that this is something that my girls could make together without too much interference! That is so adorable! I love those beautiful spring colors, too! That is the cutest thing ever! I love the look and the colors, and bonus points for ease! This is such a sweet gift idea for any mom. The cute factor is sky high, and knowing your kids made you something is always heartwarming. This would be a fun craft project to make at our mother daughters night. The girls could finish this in a evening and surprise their mothers. Oh my gosh this is adorable! I think my son would love to do something like this and I like the idea so it might be a good Mother’s Day gift. Awesome idea! I need to break down and actually buy a hot glue gun to start doing these DIY projects. At first glance, you can’t tell that you used decorative tape! How cool! My kids would love to do a project like this. Thanks for sharing! What a sweet idea for kids to make for their moms. That would be a fun craft for art teachers to do with their classes. Beautiful idea that would be great for Mothers Day. Love the colors! This is such a cute craft idea for Mother’s Day! I think my kids would love to make this for my mom! This is such a cute idea! I need to let my daughter make some of these for her grandparents! I just sent this link to my sister. She runs a daycare and was looking for Mothers Day themed crafts and this is perfect. What a cute idea! Ice cream stick crafts have really come a long way. The colors are really great and it is so nice for a son or daughter to make it with love for mom. What a cute DIY. I am so not crafty, but this looks simple enough for me to make, haha! Thank you for sharing! There’s nothing better than a gift you made yourself. I’m sure there are kids out there looking for DIY gift ideas for their moms. And this is really easy. How creative!!! There really are many uses for washi tapes. I love how it turned out. This is also a nice napkin holder for parties. How adorable of a DIY is this for mom? I love how easy it is to create and the gift can be enjoyed daily on a dining room table! What a creative idea. I love homemade gifts to and I would think this is extra special of my kids made it for me. I also have a ton of washy tape that I have no idea what to use it for so this helps me out gives me a an idea . This is a really cute and fun craft for Mother’s Day. I might have to attempt this one with my granddaughter. Very creative and thoughtful gift for Mother’s Day. My guys would do it for fun. What a cute idea! I love giving my mom DIY gifts, even as a grown adult-she cherishes them so much more than store bought items. This is cute! My eldest son would love to do this. For mothers Day this year I will probably take my mom to lunch and give her a gift basket full of things she really loves. This is such a cute idea! I haven’t seen this before, but love the concept. Thanks for sharing a new idea. This is so cute! The washi tape patterns are adorable. This will be a nice napkin holder to use over the summer! I know the focus of this post is the craft, but I love when blogs share step by step photos of how the craft actually goes. Plus, your photos are FANTASTIC! What a super cute idea! I would absolutely love for my kids to make this for me on Mother’s Day! this is such a cute gift idea, and it so easy even the really small kids can make it! This is so cute! I love the creativity and with the washi tape the sky is the limit for colours and designs! Great idea! That is a great question and I wish I had an answer. I just looked up Mother’s Day yesterday. I’m so unprepared. This is a cute gift idea. I will have to get the supplies we need to make one. I think the kids will love it. This is such a cute craft. Perfect for displaying napkins at a Mother’s Day Brunch! This is a really pretty craft idea. I will show it to my daughter and see if she wants to make one for her mom. What a simple and fun DIY project! I’d surely tell my kids about these. They will love to complete this. So super cute! I love these type of DIY. Think this would make a lovely gift and would love my kiddos to make this for me! That is so cute! I miss doing things like this with my teen. I wonder if I could convince him to do them with me again…. Thanks for sharing! That is too cute :). I miss my kids being little 🙁 we did so many diy projects and everyone loved them. This is super cute. I wish I had a GRANDBABY or something to make one of these for me. Ok, enough whining. This is adorable. My nieces would have a blast making this for my sister-in-law! I never thought of making a napkin holder for Mother’s Day but it is SO perfect! That is so cute! I’m sure kids are going to love doing it’s DIY! Such a simple, cute craft but very meaningful for a mom. I will send this to my 11 year old niece. Maybe she can make this for her mom. She’s really crafty and I know she call pull this one off easily. This is such a great idea! I am so going to make these with my kiddies for my Mom! That’s a really cute idea!! I will definitely try this! That’s nice! Any mother would love that for a Mother’s Day present. It’s the handmade projects like this that are the most loved by mothers. I loved making crafts with pop sickle sticks and pipe cleaners too. So cute, I think I may have some of my kids popsicle art. This is such a cute DIY idea. Something to cherish forever! Gifts from the heart are the best gifts. This is a beautiful DIY craft! It is easy enough to make that even the young ones could make this for their moms. Great Mother’s Day craft. Simple and creative and it looks sturdy and useable every year. This is such a cute Mother’s Day craft. I always say, the best gifts are those that come from the heart and are homemade. That has got to be one of the cutest napkin holders I’ve ever seen and it’s so easy! I lvoe that it can be custom designed too! Totally cute and easy to make. Love the Spring colors too! These are such a cute idea! I swear, I wish I were this creative. There is a picture frame made of Popsicle sticks magneted to my fridge, with a picture of my third daughter in her Daisy Girl Scout uniform. She’s in college now. Sometimes these little things our children create for us become lasting treasures along the way. I am going to share this idea with my co-leader for cub scouts! It’s adorable! Such a smart idea. It’s useful too. I’d love to have a new napkin holder, especially if the kids made it! This is really super cute! 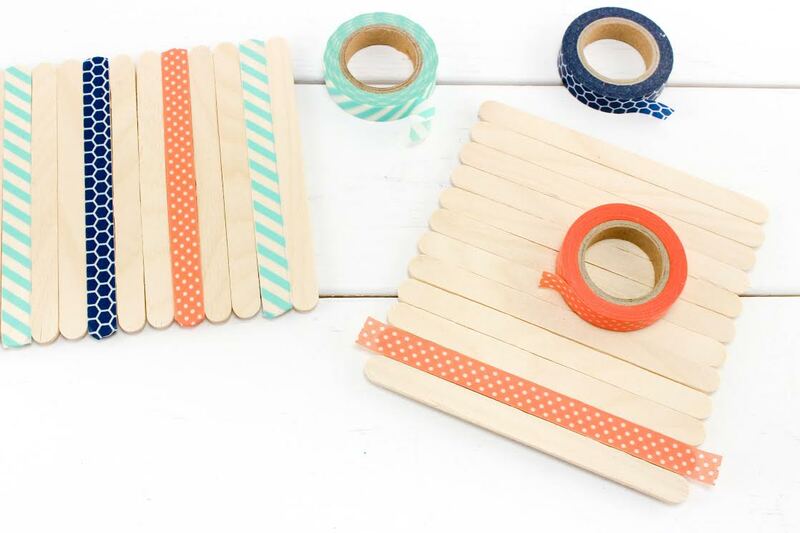 Using the washi tape really sets this apart from the usual popsicle stick crafts. aww this is such a lovely and fun idea! I will have to hint at the hubby, I am in need of a napkin holder! 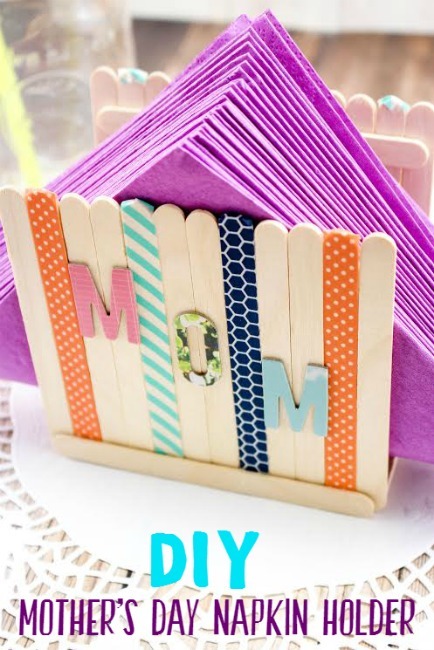 This is so cute and the perfect Mother’s Day craft for my small kids. We could make them for their Nana and Grandma. Aww this is so cute! I was looking for an easy Mother’s Day craft my kids could make for their grandma! Awesome idea can’t wait to try it! This is so cute, omg! I love the popsicle sticks, a child could make this easily. What a cute little craft! Totally doable for little hands and will work perfectly to hold napkins for a picnic! this idea is too cute, I didn’t even think about making a mothers day gift! Definitely might try out this idea! Oh that is really lovely! what a great gift idea. This is super easy, even for a non-crafty mom like me. Pinning this! That’s a really cute idea! It seems so easy for young kids to do too. Mine would love this. Omg so cute!!! And simple enough to make!!! 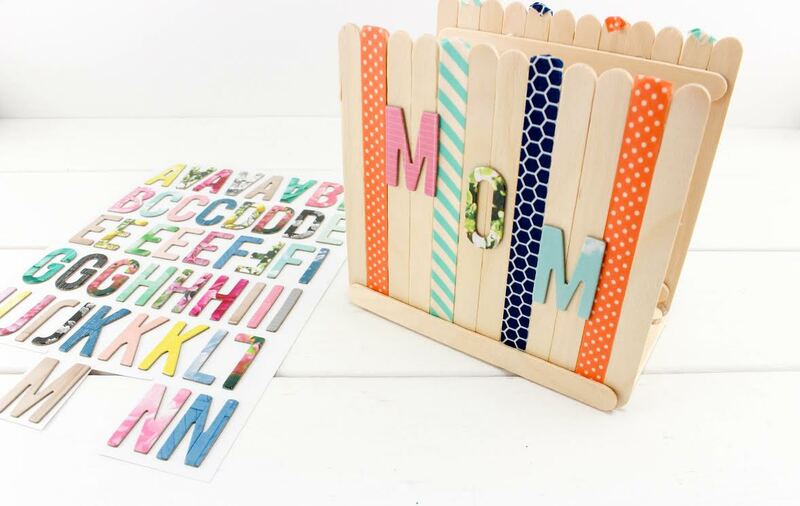 Perfect craft for any little one to make mom for Mother’s Day! This is a super cute Mother’s Day gift idea! I bet my kids would love making something like this! This is so cute, and it definitely looks like a craft that even little ones could help with!